Today, March 25th, is a “day of blogging” to support justice for the Jamie and Gladys Scott, two wrongfully imprisoned sisters in the Central Mississippi Correctional Facility. There are two central issues at stake with this important case. Most immediately, the life of Jamie Scott is being endangered due to the prison’s ongoing and cruel medical negligence. She is being denied the urgent medical care she needs for both malfunctioning kidneys and she has an infection that has spread throughout her body. Jamie is in constant severe pain and is very weak. In addition, her mother, Mrs. Evelyn Rasco, and their family including their children, have been denied visitation at times. MISSISSIPPI JUSTICE: DOUBLE-LIFE EACH FOR $11.00! On 12/24/93, the Scott County Sheriff’s Department arrested Jamie and Gladys Scott for armed robbery even though three young males, ranging from ages 14 to 18, confessed to committing the crime and the women have unwaveringly maintained their complete innocence. Despite this, the corrupt Mississippi sheriff used coercion, threats, and harassment to compel them to turn state’s evidence against the Scott sisters due to a long-standing vendetta against a family member. The Judge in the case, Marcus Gordon, has an extensive racist past that includes granting bail to the KKK murderer of 3 civil rights workers in 1964. In 10/94 the Scott Sisters were sentenced to extraordinary double-life terms each, despite the facts that no one was harmed, neither sister had prior convictions, & the amount alleged to have been taken was $11.00! Even if they were guilty as charged, this sentence is completely outrageous and cruel! THE SCOTT SISTERS ARE NOW IN THEIR 15TH YEAR OF UNJUST IMPRISONMENT! WE NEED LEGAL REPRESENTATION FOR THESE WOMEN NOW! WE NEED YOU TO PLEASE HELP TO MAKE THIS A NATIONAL NEWS STORY! Their older brother has recently returned from Iraq and has served in the US Army for 22 years. The women’s five children and grandchildren are being raised by their now ailing mother, and their father has died of a massive heart attack because of this. The emotional strain this burden has placed upon their family is absolutely immeasurable. The defendants and their family are wholly depending on support from the press, organizations, and all those dedicated to justice in making this debacle as public as possible. Please visit http://www.freethescottsisters.blogspot.com for complete info or contact their mother offline, Mrs. Evelyn Rasco, P.O. Box 7100, Pensacola, Florida 32534. For more info call: 267-636-3802. Jamie has been in the hospital since 3/15 with a very serious infection, severe weakness, extreme pain and swelling. Jamie stated that she was “kicked out” of the hospital on Tuesday to prevent Mrs. Rasco from coming up in there and asking a lot of questions, in fact an extra guard had been placed there to make certain that Mrs. Rasco didn’t come in there to see her. Jamie told Mrs. Rasco that she couldn’t believe how her 4′ tall momma caused so much worry among those prison officials! She was abruptly moved to her old cell in the prison to await the visit with her mother and family to take place Wednesday for an hour, after which her family was to visit with Gladys for an hour. However, the Assistant Warden met them at the entrance and stated that some of the children weren’t on the list to come in. After much wrangling and his personally searching the young men he permitted everyone to visit both women together BUT for one hour total, which actually ended up being less than an hour due to all of the wasted time spent being searched and with the Asst Warden on the phone rechecking names in the waiting area. The family watched in tears as Jamie climbed off of a bus and limped slowly and weakly to the visiting area and questioned staff as to why she wasn’t given a wheelchair, to which they had no answer. 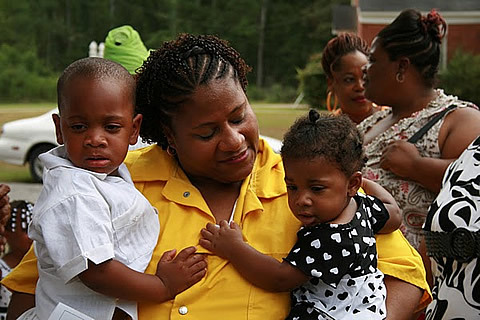 Jamie and Gladys grabbed onto each other and their family members for a very emotional reunion, especially for the children. Both women had lost quite a bit of weight, Gladys from extreme stress and depression and Jamie due to her serious illness. Jamie stated that she was told by the doctor that 6 catheter infections was much too much and that she never should have had so many temporary catheters, which blew out all of her veins where they were placed. She currently has a shunt in her groin which is extremely painful and must be surgically removed next week. She is scheduled to stay in her old cell until Friday, at which time she is told that she will be returned to the hospital. Both Jamie and Gladys want all of their supporters to know that our activities are very greatly appreciated and that they want us to keep on! Mrs. Rasco and family are also very thankful and hopeful that together we can get those women released from this horrific situation soon! If we keep pushing and use our creativity to call attention to this case, it will happen! If you write, then write about it; if you sing, sing about it; poet about it; creatively perform about it; print out flyers and distribute them at programs and events, however you can do it, please help get the word out about the plight of these women, there’s something that everyone can do! The Days of Blogging for the Scott Sisters that happened on 3/18 and is so wonderfully happening again today will really help get the word out on the case in wider and broader areas of the internet and hopefully lead to much more support and national attention! Thanks so much to all of the participants and we will be posting links to all of the blogs that participated at the Scott Sisters site, so please send them in so that you can be acknowledged! Of course everyone is encouraged to continue blogging beyond today and please do! We still don’t trust that Jamie will receive adequate medical care once these hospitalizations are completed, which was proven by the fact that as soon as she was returned from the hospital yesterday she was put right back in that moldy building where she was originally housed! JAMIE SCOTT NEEDS TO BE HOUSED IN THE MEDICAL BUILDING. and definitely not in her original cell. The Medical Bldg. would give her access to her sister, Gladys, who would help her with her activities of daily living and monitor her condition, just as other family members incarcerated together there are permitted to do with less life-threatening illnesses than Jamie suffers. We must keep pushing for media attention to what’s going on and are continually pressing for nationwide press. A complete and in-depth examination of this travesty of justice must be exposed!! Please forward all of the info at the site to anyone, anywhere that can help to make that happen, the Scott Sisters need to go prime-time to apply enough pressure to make this Gov. do the right thing. PLEASE TELL GOVERNOR BARBOUR TO GRANT INMATE JAMIE SCOTT, #19197, CMCF, AND GLADYS SCOTT, #19142, CMCF, PARDON AND RELEASE FROM PRISON. Neither sister is a threat to anyone and Jamie has a supportive family willing to care for her and obtain the medical care that she has not adequately received while in prison. These women are first-time offenders who have served 16 years in prison and are not a risk for recidivism, particularly with the gravity of Jamie’s declining health. They must be released AS SOON AS POSSIBLE! Thanks to everyone, please help to really spread the word as far as you can & ACT! BE DIRECT BUT PLEASE BE COURTEOUS — NO YELLING OR CURSING! IT WILL ONLY TAKE A FEW MINUTES, PLEASE PARTICIPATE! 12 YEARS IN PRISON IN INDIANA WHERE I LIVE. OMG!!! I can’t believe that these kind of things are still even happening. It is absurd and inhuman. Where are all the individuals that claim to be good cops or lawyers. After 15 years no one thought it would be a good idea to defend these women. I am a strong believer in Karma and my Bible states that the sins of your fathers shall fall on your children. Which means that those dirty, racist cops may think that their living a good life now but can they speak for their kids or their kids kids? Food for thought! I UNDERSTAND WHAT YOU ARE SAYING I HATE WHEN PEOPLE LIKE HIM HAVE TO STEP IN AND RUIN PEOPLES LIVES I JUST WANT SOMEONE TO TAKE HIS SPOT JUST BECAUSE WE ARE BLACK DOESN’T MEAN WE COMMIT EVERY CRIME WE ARE BLAMED FOR HE DOESN’T EVEN HAVE GOOD ENOUGH EVIDENCE FOR THIS CASE THEY NEED TO PUT AN END TO THIS AND LET THEM FREE NO ONE WAS HURT AND THEY HAVE NO CRIMINAL RECORD WHAT SO EVER LET THEM GO PLEASE THEY DESERVE IT. I am very sadden about the news that I have just learned about this afternoon on the Radio Station 105.9 In Detroit Michigan. over eleven dollars i could not beleive that, when their are people that get away with more than that. Just like I said early I just found out about this, is there anything that I can do or help out with because there are others that is wrongfully put in prison slso. Like I said I am in a maze right now about this. ITS A SHAME OF WHAT THESE YOUNG LADIES ARE GOING THREW. TRUST AND BELIEVE ME I HAVE CONTACTED MY LOCAL NEWS,CNN,MSNBC AND A COUPLE OF REDIO STATIONS AND NO ONE WANNA TALK ABOUT IT. I FALL ON MY NEASES EVERY NIGHT AND PRAY THAT THESE YOUNG LADIES COME OUT OF THIS AND JAMIE SCOTT WILL FIGHT AND WIN THAT BATTLE WITH KIDNEY FAILER. GOD BLESS THE SCOTT SISTERS. YALL WILL BE RELEASED ONE DAY SOON AS LONG AS YOU KEEP GOD IN YOUR LIFE. I would like to bring your attention to the case of Jamie and Gladys Scott. These sisters have served more than 15 years of a double life term where no one was murdered or injured. State’s witnesses have testified to their innocence. Jamie Scott’s kidneys have failed and her health is fading fast. We need your help now. Mississippi needs to know that those of us who believe in justice and human rights are prepared to take a stand for the Scott Sisters. FREE THE SCOTT SISTERS NOW!!!!! PLEASE FREE THESE SISTERS. IF THEY DID DO IT, THEY HAVE LEARNED THEIR LESSON NOW. I AM 17 YEARS OLD. AND I JUST DON’T THINK THIS IS FAIR. JUST TAKE THE TIME AS YOU ARE READING MY COMMENT AND PUT YOUSELF IN THEIR SITUATION. WHAT WOULD YOU WANT THEM TO DO TO YOU?? AND HOW WOULD YOU FEEL AFTER 15 YEARS?? A rally was held for the Scott Sisters on March 6, 2010 at the Capitol in Mississippi. Highlights from the rally can be found at the link below. Jamie Scott was returned to her regular jail cell at CMCF in 2A B Zone on approximately March 30. A permanent fistula was placed in her arm, however she still has the painful catheter in her groin area. Jamie was told this will remain there for about 6 more weeks as her arm heals and her veins become strong enough to take the dialysis. After surgery her potassium spiked and she had vomiting and seizure. She has been stable since that time as far as we have been able to determine. One of the doctors who examined Jamie told her that she is at stage 5 kidney failure, which is the worst and considered end stage, and that in the “free” world she would qualify to be on the list for a kidney transplant. Other testing confirmed this and concur that it is the fault of MDOC because they should have caught it much sooner than when it reached stage 5, especially in light of Jamie’s constant medical complaints and their denial or shuffling of her medications. MDOC should not have been placing those temporary catheters into her neck instead of placing a shunt in her arm before now, but they were basically taking the cheap way out. Jamie needs to be RELEASED because the prison cannot be trusted to give her ANY SEMBLANCE of adequate medical care, particularly in her advanced stage of disease! As has been posted previously, Dr. Gloria Perry stated that Jamie is not a candidate for transplant! Jamie’s sister and other family members have offered to be tested for compatibility, yet been denied by MDOC. he said. “I just signed off on 72 persons for medical release,” he said. Jamie nor Mrs. Rasco have received any information to indicate whether or not Jamie’s name might be on this list. Free The Scott Sisters Now in Mississippi is collecting 10,000 signatures on the below letter, so please support and pass them on! Please copy and paste the below, sign and return to Atty Lumumba’s office as instructed, this is very important so please participate!! daily living and monitor her condition, just as other family members incarcerated together there are permitted to do with less life-threatening illnesses than Jamie suffers. far and wide, the Scott Sisters need to go prime-time to apply enough pressure to make this Gov. do the right thing. health. They must be released AS SOON AS POSSIBLE! That sad to read and hear or such a thing .Recently a man killed some school student where I lived he got 5 years.Things like this just make me want to absolutly lose it .I am so sad to hear this is happening to these people . I truly cant comprehend why this has not gotten out I know the media doesnt want stuff like this .It would be good to go around the town ,clubs and bars ,etc to get people to unite and hear about this . Evelyn Rasco, mother of the Scott Sisters, asked supporters to contact the MS Parole Board on 27 Sep 2010. The governor and the Parole Board have had enough time to deliberate. How much longer must they wait?